Friends this is with out a word of a lie the easiest Spring Treat the Bunny could possibly bring- instructions are as follows and come courtesy of my Mom- queen of toddlers and voted Most Fun Person 2012 by the Littles. - creating a bit of a divit in the middle for the "eggs"
Seriously the easiest thing on the face of the planet and oh so cute! Perhaps not at all the healthiest thing but really cute and easy for Littles to help with. Holidays like Easter are so full of sugar and candy any ways right now is the perfect time to let them "bake" a little treat of their own. Friends it is Friday again and weather you observe Easter for spiritual reasons or more for the long weekend aspect I hope you take a moment and celebrate the return of hope, the sun, rebirth, Spring, Family and obviously the Easter Bunny! We are headed to the Okanagan to be with our family and we are all so happy- for with the return of Spring and the sun is the return of our trips East! For me Easter is about hope and birth- new babies- the sun returning- but overall a celebration of hope. It makes sense then that we have an overbearing amount of bunnies, chicks and eggs populating our home right now- if we had a yard I am sure we would have the real deal but until that day we have the paper and chocolate versions! 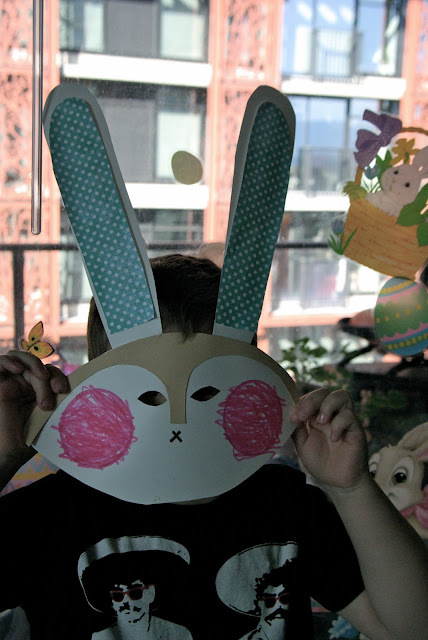 Yesterday was such a beautiful day- sunny and bright and full of hope that we felt compelled to make these fun little bunny masks- Miss Lo and her little pal Miss Ro thought this to be the best idea ever! I had everything cut out and ready to go- the kiddos just needed to glue and colour in the cheeks- a simple and tidy little project on a sunny morning. 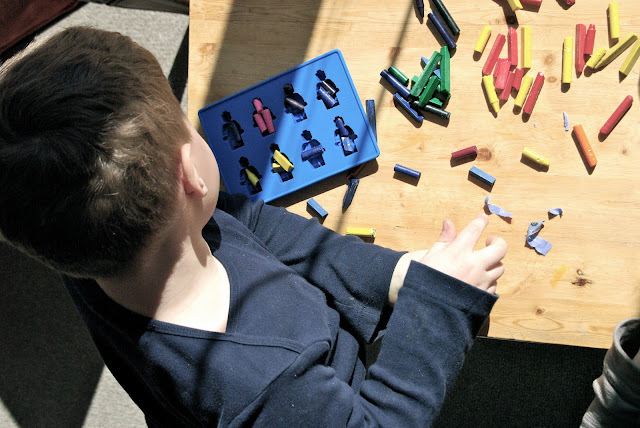 As I have mentioned in the past if you set up kids to succeed with an art project then it is a pleasant experience for all- have everything cut out and on hand before you begin. I find that when making masks the best paper to use is inexpensive bristol board- the white paper we used is about half of a large sheet of bristol or poster board. We used a hole punch on the side of the mask to thread ribbon through which was how we tied the masks on their faces- side note- if you have high pony tails like Miss Lo it can be tricky to keep your mask up! Once these Littles had their masks tied on they were instantly transformed into a bevy of adorable Spring bunnies- hop hop hopping all over the deck- sniffing out the new garlic and strawberry plants! 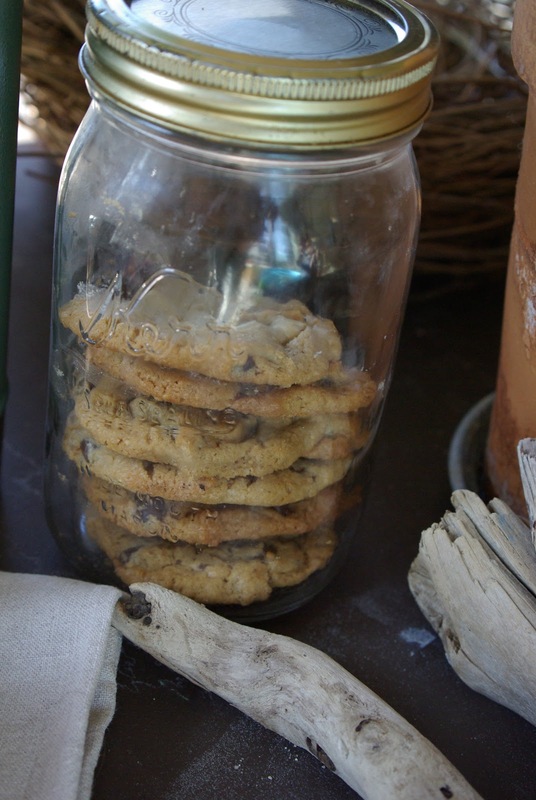 Why: who doesn't love a good cookie? This recipe is purely for fun! - cream butter; add sugar gradually, beating until creamy- mix in egg, peanut butter, salt & baking soda. * just a note- I made these gluten free and replaced the wheat flour with chickpea flour- they turned out really good- a bit crisper than the original recipe but equally delish! 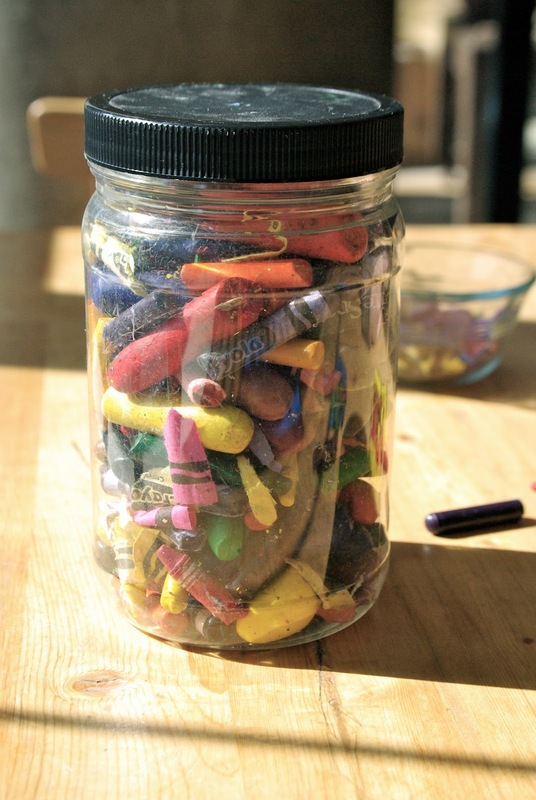 If you are like me then you most likely have this totally random jar of busted up, broken down crayons hanging around your home. It seems like such a shame to throw them away- because again if you are like me you might have craft hoarding tendencies! I am not sure what I am saving all these bits and bobs for- perhaps one day when the world runs out of oil I will have the market cornered on crayon bits- at any rate until that day there they sit in our studio. A while back I had spotted this awesome Lego guy silicone ice cube tray at the Lego store- on a repeat visit to purchase a birthday gift for a school friend The Mr. picked one up for me- we work in synchronicity like that- yup we are pretty much perfect- cue internal laughter! 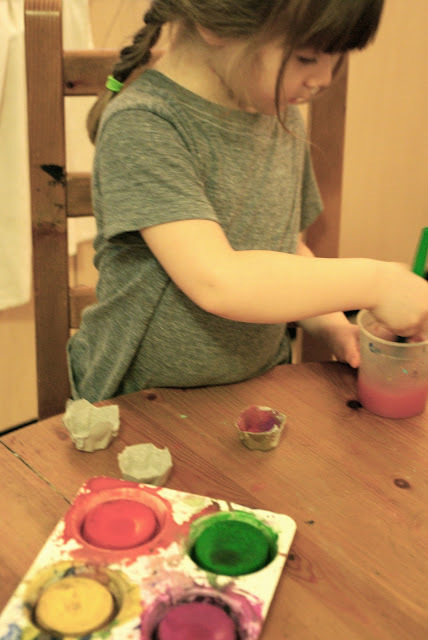 So we take one large container of busted up crayon bits and one awesome silicone Lego ice cube tray- we throw them together and what do we get? First- before we throw them together we have the excruciating task of removing all those paper wrappers from the crayons- this is where tiny hands come in handy. The Littles were so excited about what we were about to do they happily unwrapped all the chewed up, busted, nose stuffed crayon bits- seriously you really do need to remove all the paper bits unless you want an oven fire. OK so half an hour later- yes! A half hour- they sat still for that long- semi quietly- unwrapping crayons! We finally get to the part where we decide what colours our new crayons will be- this is the super cool bit because if you put different colours together in one mold they will melt in a way that creates multi coloured colouring- which of course is awesome! Now this is the serious crafty bit- the mom part- where I tell you all the important safety stuff. There is no claim from Lego or any maker of silicone ice cube trays at all that says it is a great idea to put in in the oven- however these ice cube trays are dish washer safe- and are silicone- therefor from all info gathered on the interwebs safe for heat. The Internet would never lie would it? Still I did this on a day when we opened our doors wide and we had plenty of ventilation- honestly I was more worried about the smells from the cheap crayons melting- and we let our kids eat those. Still proceed with caution and never ever use these ice cube trays for ice cubes again! Fill your trays generously and heat your oven to 250 degrees- you will be melting your new crayons for about 15 minutes but all ovens are different so if yours runs a bit hot just keep an eye on things. You may want to check things at the 12 minute mark anyways as we needed to add more crayon bits- and by "we" I mean me. Once the crayon wax looks well melted remove tray from oven- yes it has overflowed in this picture and I am sure glad I put parchment paper on my cookie tray- Ugg the thought of cleaning my oven makes me want to drink even more! Anywho remove your tray and let cool for a few minutes while the wax sets up- then place in freezer to really cool. Pop out of tray and gently remove excess wax- voila your awesome new custom crayons! Break out those colouring books and enjoy! Colouring with different shapes makes crayons super cool again and these rad Lego crayons kept our Littles busy for the rest of the afternoon! Just to let all our friends know there is a very good chance that you will all be getting some of these in the coming days- they are completely addictive to make and equally entertaining for this Momma and all the kiddos! P.S.- these little crayons would fit perfectly into a felt Easter Egg and I am sure the Easter Bunny likes to bring things like this to the egg hunt! P.S.S- all the instructions I found on the old dot.com system indicate that you can make these goodies in the microwave but DO NOT microwave your silicone molds! You need to melt the crayon wax in a glass cup first the pour into molds- the only down side of that is you don't get the groovy colours. One of the best things about living in Vancouver- aside from the beaches is the vast network of bike paths running through out the city. Before kids The Mr. and I used to bike quite a bit- in fact before moving to Vancouver I was a moderately enthusiastic mountain biker- I like the idea but not so much the hard work. 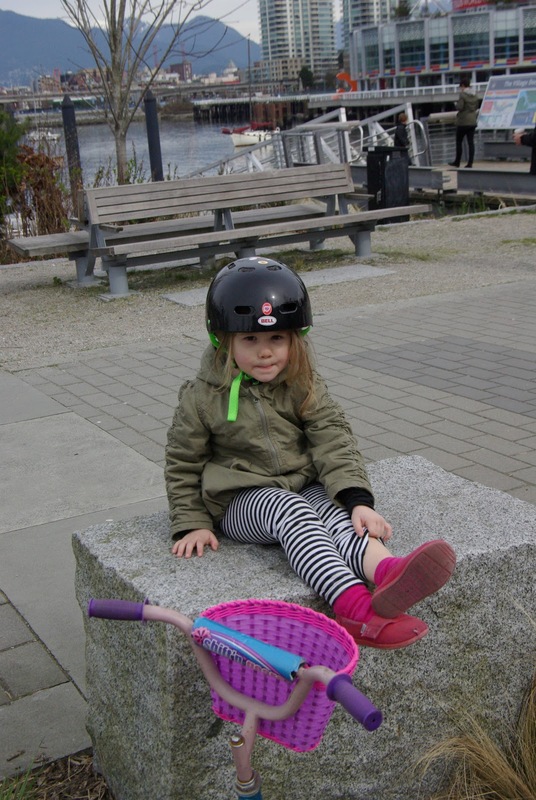 At any rate we are pretty stoked that these Little of ours also like riding bikes. 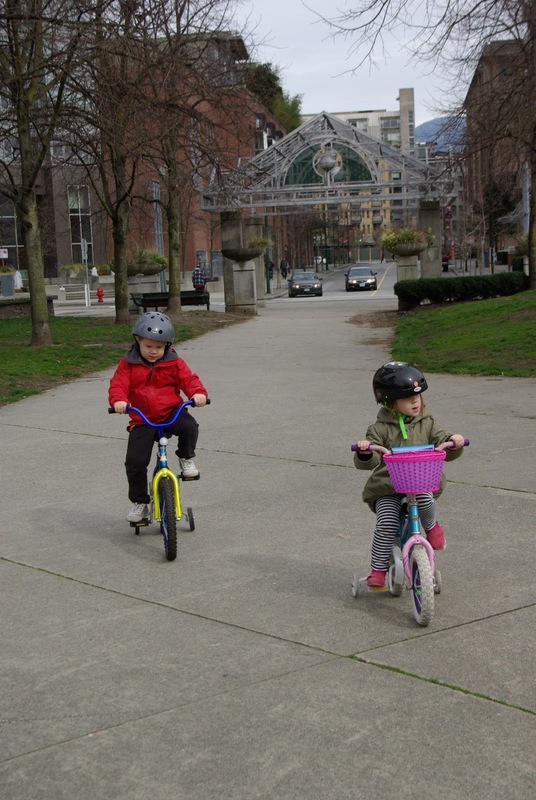 Living in the heart of the city we have sort of a two pronged approach to bike riding- the first prong of that attack is transportation- getting from point A to point B with the bike trailer in tow- comes in handy when heading out to the pool at Second Beach or in the fall to school. This is loads of fun for Momma and Daddy- but the kids get a bit bored in the trailer. Now we recognize that our kiddos do not have a safe culdi sac at the end of their street in which to spend hours free wheeling like their cousins in the Okanagan do. So the Mr. and I have made it a priority to give our kids the freedom of biking on their own- this is the second prong of our approach. 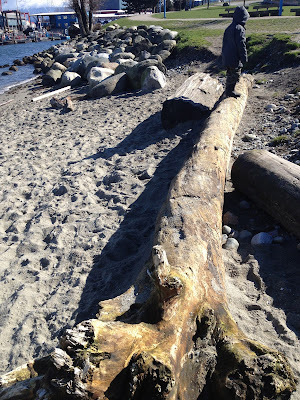 This scenario consists of the kids riding on the Sea Wall with The Mr. and I running after them- lots of fun for the Littles and I am sure humorous for anybody who happens to catch a glimpse of me running! It is so funny how their attitude towards biking really reflects their personalities- The Boy is super cautious- over thinking peddling and steering at the same time which often results in crashing into something. Miss Lo however is a Speed Racer- a direct quote from earlier today reflects this " I can not slow down Mommy- bikes are supposed to go fast!" Sigh- this is my daughter and I think we are in trouble! So we took the Little's bikes out for a spin on the Sea Wall on Sunday- which was teaming with joggers and dog walkers- we should have had a mega phone announcing our procession- letting people know they should clear a path! We rode over to the Olympic Village ad of course could not resist a stop at Terra Breads- it is Hot Cross Bun season! I love me some Hot Cross Buns- I told Miss Lo that when I was pregnant with her I could not stop eating Hot Cross Buns- I would stop at Terra Breads on my way to work and by 3 or 4 and eat them all by lunch time- yes I would go back for more in the afternoon! She thinks I am weird. The Boy agreed to try a Hot Cross Bun- although he regarded it with suspicion at first- I noticed he was sort of shredding it while eating it but didn't say anything. When he was done his baked Easter treat I asked him how he liked Hot Cross Buns- "all right I supposed- except for the raisins- but all aside from that it was all right"
We played a few rounds of chase under the giant birds and speculated on the size of the condos surrounding us- then we started the trip home- and although their peddling was a bit slower these Littles of ours made it all the way home on their bikes. The sun was shining brightly and a light breeze blowing as we rounded out our weekend and wound our way back along the Sea Wall! 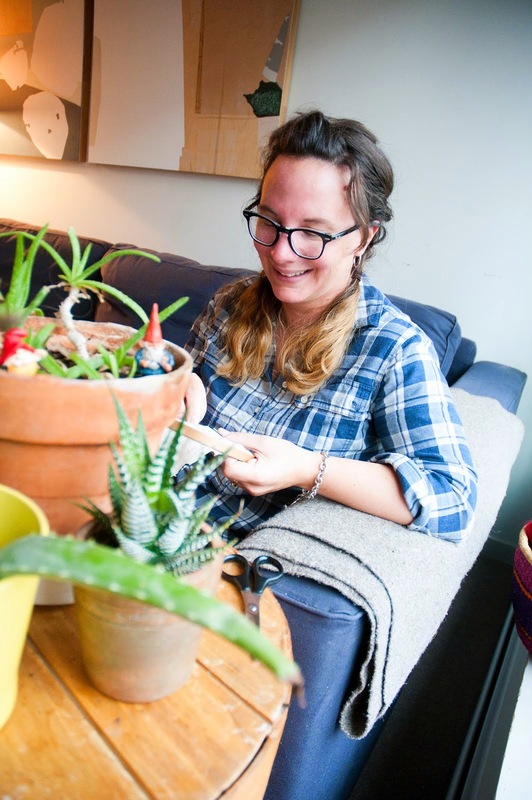 Ahhh the sun is shining and my hands are getting itchy to dig in some dirt- no it is not chicken pox- it is my natural inclination to get things growing for the season! Inspired by this awesome little seed starter kit from Strathcona Urban Seed Collective we decided to get a few things started this afternoon. While our lettuce, radishes, peas and carrots will have to wait a few more weeks and be sewn directly- today was a good day to start tomatoes. I remember as a girl going to my Grandma's house for tea- her tea parties were endless- much information and many cookies could be gathered if one was willing to be patient and quiet. While the tea was steeped in her old Pyrex tea pot- poured out into slightly cracked, well used china cups- the sunshine would stream into her dining nook- dust moats lazily floating down onto the orange Formica table top- my sister and I would sit and listen and look. The dining nook at my Gran's was the perfect spot for her seedlings to get their start in the world- seemingly endless amounts of egg cartons- sitting patiently in the drowsy March sunshine. It may be the memory of my Grandma and her seedlings that spurs me forward on this sunny March day- so far away from the orange Formica table and yet still very close. To show my Littles what our Grandma showed my sister and I- how to start a handful of what at first glance appears to be nothing to become something that will nourish our bodies and souls in a way that no store bought anything possibly could. I will admit that I am a bit of a novice at this seed stuff- I usually buy my tomato plants all set and ready to go directly into the garden mid May- so this for me is a bit of a gamble- or a science experiment. I am a bit lazy this way- my parents start everything from seed right about now in mini green houses(plastic salad boxes- so clever!) in their basement- I figure if they can do it then we should be able to do it too! On the advice of a much more seasoned gardener than myself we are trying out the egg shell method of starting seedlings. The general idea is- get some empty egg shells and clean them out well- punch a tiny hole in the bottom for drainage- fill with soil and plant your seeds- when the seedling starts to get too big simply crack the shell(add it in to the dirt) and plant it into a larger container- easy peasy lemon squeezy! These days they are getting longer, warmer and brighter- Spring is here- yes even if it is snowing- as is the case in much of our country- believe it or not Spring is here! Once our little seedlings were planted we brought them inside to our own warm window sill- to patiently wait while tea is drunk near by- a metaphor perhaps- things coming full circle- my own Littles sitting and watching and waiting for their seeds to pop up. Friends it is Friday again! We made it through our first Spring Break- OK it was only a week but I am looking forward to school next week! So many cool things happening in our community this weekend but we are sticking close to home with a trip to the Farmer's Market and then dinner with friends! May you have plenty of sunshine at your back laughter in your ears, and coffee in your mug- Happy Friday Friends! These days we have been consuming a lot of eggs- like every day pretty much for breakfast- they are the new- old favourite around these parts- especially when topped with salsa and avocado- maybe a smattering of feta- delish and now I am faintly hungry. Needless to say we have several empty egg cartons loitering around the recycling station just waiting to be returned to the egg vendors at the Farmer's Market- the thing is- said recycling station is also in our studio- AKA craft room- so I see those egg cartons a lot and they were begging to be used in a craft! Hearkening back to my own Spring days in the old school house- which is way too long ago so we won't say how far back we are hearkening to- I had a vague recollection of Spring flowers made from egg cartons! Eureka! Surely I am the only mother to think of this since the 1980's! I clearly must be some sort of craft genius! We get all set up- adding a few things like colourful tiny cup cake holders for variegation in texture- along with the basic paints and pipe cleaners- the great thing is this is all stuff we have in the house! We are happily painting away and I am basking in my ingenuity when The Boy pipes up "oh yeah we all ready made these at school last week". Totally nonchalant like in an off handed manner that reveals he clearly is unaware that my world as most clever mom is crumbling! The Littles continue to happily make a giant mess paint as I ponder this new information- we finish up the painting and I mop down the walls before assembling the flowers onto the pipe cleaners and adding crepe paper leaves- OK I added the crepe paper leaves because at this point two out of three crafters have moved on to better things- Miss Lo is the last crafter standing. So although a few kiddos were not so into this craft and my world was shattered at least Miss Lo had a great time- especially after she put together her bouquet and started re-enacting her role as flower girl from her older cousin's wedding last summer. This is the perfect craft for a girly- girl who is into flowers and pink- not so great for boys who really just want to paint all of their flowers black and brown! Just to let you know I googled egg carton flowers after we were all done our own project- and there is a plethora of really lovely designs out there- I was shocked that grown women with no toddlers in sight have devoted what seems like a fair amount of time and energy to crafting with egg cartons! I am impressed and humbled at how far this beloved school days craft has evolved- it might be old hat on the interwebs but it was brand new and totally awesome to one crafty gal on a rainy Spring day- and that is good enough for me! Happy Spring! We have had two halfway decent days of weather- and by halfway I mean one was outstandingly sunny but freezing cold and the other was over cast but not raining! Well the rain arrived last night- along with the wind- pounding sideways into our windows and waking us up at odd hours of the night- even if March did not come in like a lion Spring certainly made it's arrival spectacular! Of course we took full advantage of the non- rainy- halfway decent weather over the past few days- it is Spring Break for The Boy and so some sort of adventures were called for! First up on Monday morning was Crab Park over near the Port of Vancouver- not your most glamorous or easy to reach park but a little hidden gem in Vancouver's cap! 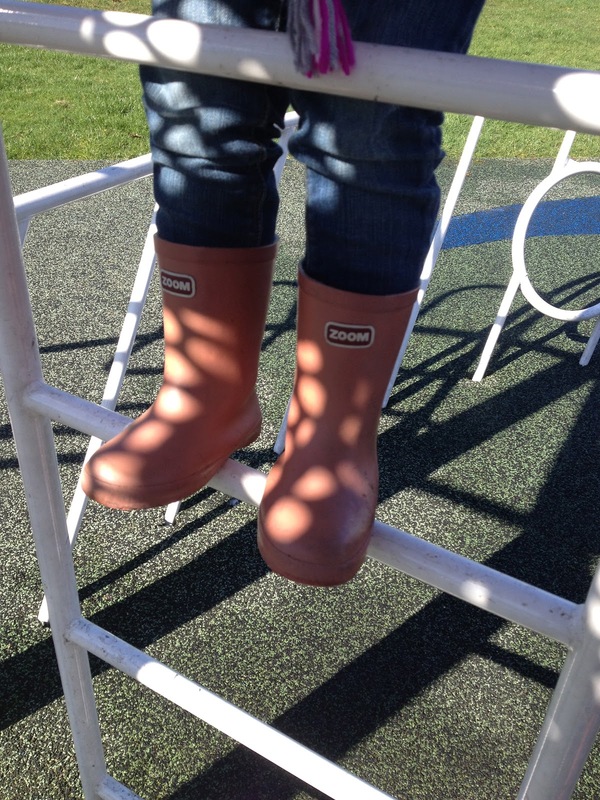 It has a great playground that our Littles love to climb- as I nervously hover and try not to over react- as well as a beach perfect for digging and throwing rocks. Of course we have been sprinkling the fun park times liberally with treats- mainly as bribes as we are completely on foot this week- the goal is no stroller for Miss Lo. I have mixed feelings about this as she is my baby and I am not sure I am ready to sell the stroller- but at almost 3 feet tall she looks pretty ridiculous sitting in it! So we are starting out with small- close to home jaunts that are easily walkable for her- or in an emergency I can carry her home. So far so good- this kiddo just needs some running shes and she is ready to hit the pavement! Tuesday we headed over to the little park just by Science World- this is another of our favourites although I don't know the name of it! Located right at the tip of False Creek on the Sea Wall this little park is very popular with preschools and with in minutes we were over run with tiny children. Still it was a nice walk through the neighbourhood- noticing what is new- checking out the progress of Soul Food- the giant urban farm set up in the parking lot across from Rodger's Arena. Spring is here- no trumpets and fan fair just lots of wind and rain- which continue still this morning- we are headed to an indoor activity today- Science World with a group of our friends- The Boy has been counting down the days! This afternoon we might have a small Springish project to get us into the swing of things to come out on the deck- yes we are going to plant some seeds to start indoors- seems like the thing to do in celebration of this new season- Spring we are happy to see you!